Comfortable hooded sweatshirt made of a soft cotton-modal-spandex blend with renowned pattern print façades. 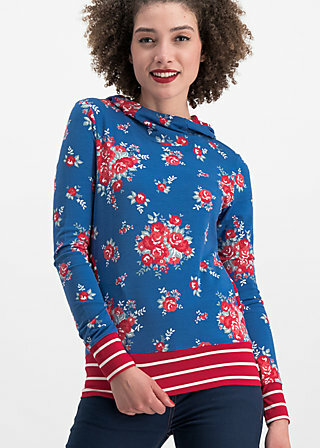 The snug hoodie is fitted with details consisting of contrast fabric in harmonising colours – the unique patterns turn this feel-good sweater into a very special favourite! The wide cuffs on the sleeves and hems, the inner lining of the hood and the pocket edgings are made of accentuating contrast jersey. Once again, the fabric 'tales' of our collection are successfully transformed into an extraordinary dream of a pattern. Our love of fabrics ensures pleasant wearing comfort!